Barrel: 10.5" Chrome Moly vanadium steel, phosphate coated and chambered in 300AAC Blackout with a 1 in 8" twist rate. pistol-length gas barrel is finished off with a PSA 9" Lightweight M-Lok Rail, a low profile gas block and an A2 Style Flash hider. can the flash suppressor be removed and a silencer be installed? Is this a complete upper? So if I purchase a complete lower it would be a complete AR? BEST ANSWER: Yes this is a complete upper all you need is some sort of sighting system to finish it off. Get their complete lower and you have a great pistol or SBR. That is correct. I own this upper and absolutely love it. The only thing I changed was the flash hider to one that’s fits my suppressor and I swapped out the charging handle. The upper is ready to go as is and be attached to your complete lower. Yes, but remember, you would need to use a pistol lower or go through the SBR process to be legal. Yes this is a complete upper. Purchasing a complete lower will assembl a rifle or pistol. Yes, as long as you have a complete lower, you have an AR rifle. Yes, just attach it and you're ready to go. Can this be ordered with an adjustable gas block? BEST ANSWER: this upper only comes with a standard low profile gas block. What is the inner diameter of the hand guard? Is the barrel an H-Bar? BEST ANSWER: this barrel has an .850" diameter behind gas block. A2 profile. Leads me to believe no. do i need some kind if stamp for this? i will buy the pistol lower too. BEST ANSWER: No, as long as you are not mounting a physical buttock onto the lower. Very well balanced and the QD hole is great for handling. I bought earlier model without QD hole. Accuracy is very good and can put hole into hole with a cheap red dot at 10-25 meters. BUT the pistol gas system on ALL 300 BLK from PSA means the extraction will happen before the chamber pressure drops to safe level the the brass shrinks again to come loose. Over gassing the system will tear the cartridge rim and pop out primers that will jam the bolt. Adjustable gas block or heavier H3 buffer will NOT HELP. Use ONLY SUB SONIC ammo speed or Super Sonic well below 2,000 fps. 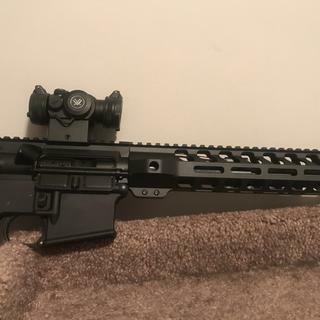 Great upper for my 300AAC Blackout build! This is a great value upper for my build. Put everything together and was shooting <1” 3-shot groups at 115 yards with junk factory ammo! Love it. Finish one project and now ready for the next. I was very impressed with the upper. It’s fit, functionality, and accuracy were superior to what I had imagined. Very fast shipping. This was used on my low budget 80% hunting pistol. The 100 yard groups were amazing with 120grain Remington otm. This is my 10 year olds favorite gun! So far, so good. 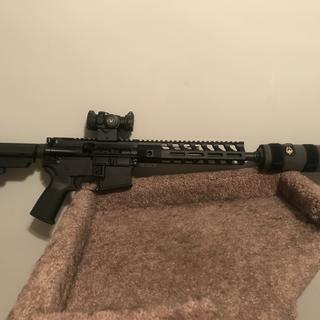 Only about 20 rounds deep; mounted 1-4x glass right away and ran several rounds from several magazines to find a reliable match to hunt with and felt confident enough to then do so with new platform almost immediately following purchase. Reliable function and groups far superior to the shotgun so that is what I went with. 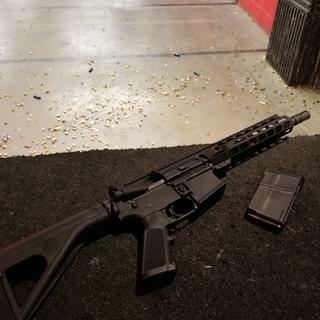 I feel pretty confident with the accuracy so far and am looking forward to becoming more acquainted with the rifle in its varied capacities in the near future. I had to clean/degrease all the screws and apply loctite but, now the fore-end is solid and I get repeatable zero with my QD mount from Midwest Industries when removed and reattached to the same T-slot. Very satisfied with this buy. It runs subs and supers in the suppressor great. Great product,speedy and reliable service. This was a big surprise for me! I really like this particular item from PSA. The "heavy" barrel is really what could be the difference between somewhat accurate and very accurate at 50 to even 100 yards. It's built very well, not a loss fitting on it. Just what the Doc ordered. Upper is as I wanted it. 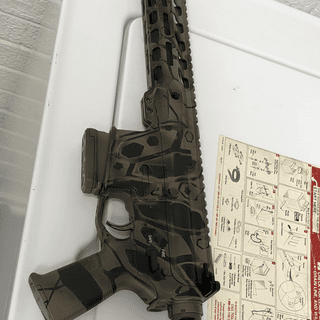 Now it would have been nice if PSA had shipped the proper pistol build kit instead of a rifle - go to jail for and SBR kit and delayed the build 6 weeks till the right parts arrived. I did not unbox this upper until the pistol lower was completed and ready. Thankfully, a bit of lube and pop the pins in place and it was range ready. I have a 4 MOA red dot 1x that should fit the Pistol use just right. I have not gotten out to try it out yet but it looks great and matches and fits the lower I have for it perfectly. Works perfect. 0 failures of any kind. I did use a magpal mag specifically for 300. Seems accurate. Open sights and old eyes, but still groups quite well. Picked this upper up while it was on sale and it was the perfect way to finish off my pistol build. 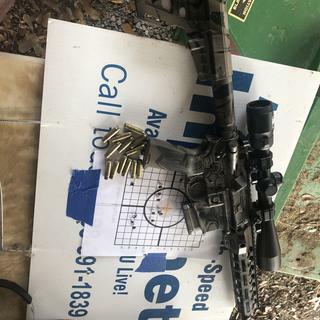 I was able to take it out to my local range on memorial day and it functioned flawlessly. I tested it using Remington 124gr and Sig Sauer 220gr subsonic ammo without a single malfunction. I would definitely recommend this upper to anyone looking for a great upper on a budget. Perfect size to still get good performance out of the .300 BLK. Great suppressed. Affordable package that’s ready to go minus sights. Great assembly of parts functions very well. Very good fit would definitely buy again. Talk about a “bang for your buck” upper. I have a few AR pistols, and I thought about just buying a 300AAC Blackout barrel and putting it on pistol I already had. But when this complete upper went on sale, and so did a pistol lower... I pulled the trigger. So happy I did, blown away by the quality and accuracy of PSA firearms. I’ve probably put 200 rounds thought it so far, and not a single malfunction. I paired this with a Sig Romeo 5 red dot, and couldn’t be happier! Outstanding quality. Will recommend PSA to my friends. Great fit and finish at a great price. Shipped fast and arrived packaged securely. Will continue to be a customer. Could not beat it for price and PSA always does good on their products! Great upper, and she’s a beauty! I have not had any issues at all. Everything looks and works as it should. Quality seems pretty good. No complaints. 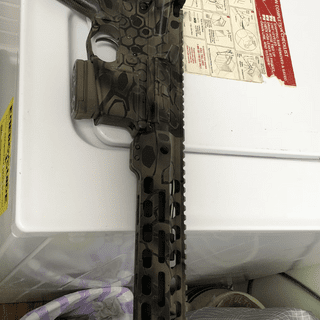 I bought this upper as a budget build for my son who will be learning to hunt, more than enough pigs in Tx to shoot at. It has a very good weight, the handgaurd is mlok featured and covers a good length of the barrel. BCG is standard, so a little cleaning and lite sanding with 3000 grit to smooth out the finish helps the assembly run real smooth. Took it to test fire and it performs flawless, no fte or ftfs. I very purchased from PSA in the past and will so in the future for another build. Great quality at half the price. That's why these companies will always flourish.